Chuck Hagel, the former secretary of defense who resigned under pressure from the Obama administration last November, said in a recent interview that the White House castigated him for refusing to approve the transfer of Guantanamo Bay detainees he deemed too dangerous. In an interview with Foreign Policy, Hagel said that the Obama administration pressured him to approve transfers of Guantanamo prisoners to other countries. When he responded by refusing or delaying transfers of dozens of detainees who he judged were at risk to rejoin terrorist organizations, he received "brutal" pushback from the White House. "It got pretty bad, pretty brutal," Hagel, a Vietnam War veteran, stated. "I’d get the hell beat out of me all the time on this at the White House." President Obama, who promised to close the military prison at the Guantanamo Bay Naval Base in Cuba when he took office, has pressed forward with the effort despite concerns from lawmakers and increased terrorism fears in the country. Obama has threatened to use executive action to shutter the prison. Last week, reports surfaced that a former Guantanamo Bay detainee named Ibrahim al-Qosi had joined the al Qaeda branch in Yemen, appearing as a leader of the group in jihadist propaganda. 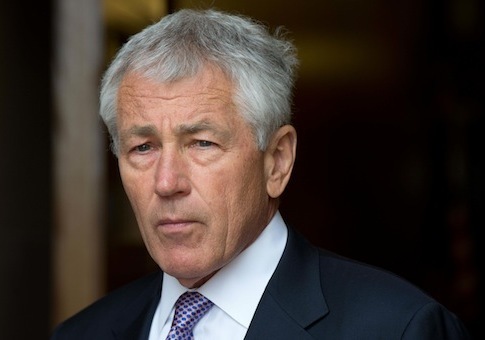 [Hagel] said the Pentagon was subject to debilitating meddling and micromanagement by the White House–echoing criticism made by his predecessors, Robert Gates and Leon Panetta. Looking back on his tenure, Hagel said in the Dec. 10 interview that he remains puzzled as to why some administration officials sought to "destroy" him personally in his final days in office, castigating him in anonymous comments to newspapers even after he had handed in his resignation. Although he does not identify her by name, Hagel’s criticisms are clearly aimed at Obama’s national security advisor, Susan Rice, and some of her staff. Hagel’s former aides, and former White House officials, say the defense secretary frequently butted heads with Rice over Syria policy and the U.S. military prison at Guantánamo. On Syria, Hagel said that Obama’s decision to hold off on military action after President Bashar al-Assad crossed his so-called "red line" by using chemical weapons on his own people "hurt the credibility" of the United States. "A president’s word is a big thing, and when the president says things, that’s a big deal," he added. Hagel also said that he received criticism from the White House after describing the ISIS threat as "beyond anything that we’ve seen" in August of last year. Months earlier, Obama had referred to ISIS as a "J.V. team." "Then I got accused of trying to hype something, overstate something, and make something more than it was," Hagel said. "I didn’t know all of it, but I knew we were up against something here that we had never seen before. And in many ways, we were not prepared for it." Last month, ISIS carried out coordinated terror attacks in Paris that killed 130 people and wounded hundreds of others. This entry was posted in National Security and tagged Barack Obama, Chuck Hagel, Guantanamo, Syria. Bookmark the permalink.